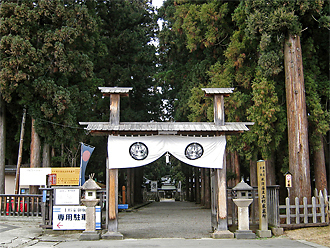 The shrine was built to honor Uesugi Kenshin, one of the greatest and bravest warriors during the period of warring states. It is one of the most well known sights in Yonezawa and citizens visit all year round, praying for new year's prosperity, blessings for newborn children and so on. The current building was designed in 1913 by Chuta Ito, who is known throughout Japan as the leading expert in shrine architecture. 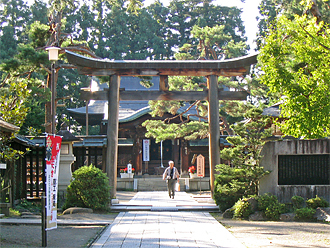 This shrine is dedicated to Uesugi Yozan, the 9th lord of theYonezawa Domain. It is also sacred to Kagekatsu Uesugi, the 1st lord of Yonezawa, and Naoe Kanetsugu, a chief vassal of the Uesugi Clan. 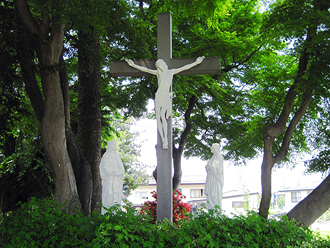 This site is home to the gravesites of the lords of the Yonezawa domain. Sorrounded by over 400 year-old cedar trees the Mausoleum is engulfed in a solemn and calm atmosphere. This is a government-designated historical site. A collection of the Uesugi Clan’s treasures on display. Stored within the walls of the treasure house of Uesugi-Jinja Shrine is a collection of around 300 items consisting of Katanas, Armour, and Paintings; all on display. A collection of items designated important cultural property makes this display a must see for any history buff. `Kinkozane Azagiodoshi Nimaidō Gusoku’, the famous armor used by Naoe Kanetsugu, distinctive for its decorative head-piece with the Japanese Character ‘Ai’ (love) is displayed here. Other rare articles include the body armor used by Uesugi Kenshin known as ‘Iroiro Odoshi Haramaki’ meaning ‘Multi-color laced cuirass’ (considered an item of important cultural heritage) and the ‘Murasaki Itōdoshiiyozane Yonmai Dō Zoku’ used by Uesugi Kagekatsu which features a head-piece based off the sun (considered an important cultural item of the prefecture) as well as other treasures from the Uesugi clan. ※Prices displayed in brackets refer to groups over 20 persons. 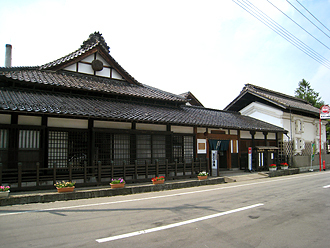 The national treasure “Rakuchu Rakugaizu Byobu” decorative screen and “Uesugike Monjo” are part of the Yonezawa City Uesugi Museum's vast collection, which is composed of thousands of items associated with clan Uesugi. 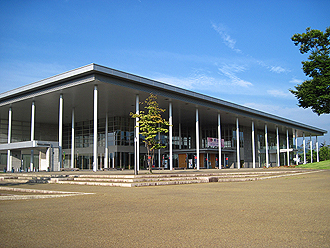 The museum provides entertaining opportunities to learn about Yonezawa, such as the theater and the digital exhibition room where visitors can enjoy the virtual imagery of “Rakuchu Rakugaizu Byobu” using computer graphics. The graves of the wives and children of Yonezawa’s feudal lords can be found here, as well as the grave of Naoe Kanetsugu and his wife. 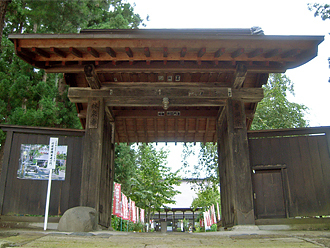 Approximately 500 years ago Nagaoka Getora (later Uesugi Kenshin)’s grandfather Nagao Yoshikage erected Rinsen-ji temple in the town of Takada in Echigo no Kuni (modern day Niigata) in memorial to his father. Kenshin, who later inherited the temple then turned it into the Uesugi Clan’s family temple. In the 6th year of the Keichō Era (1601), after Kagekatsu was given the Yonezawa domain (a significantly less wealthy domain than he previously had ruled over) as punishment the temple was also moved to Yonezawa. 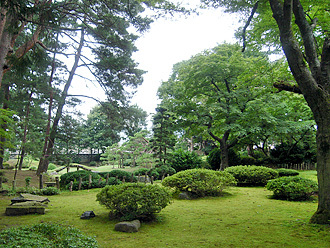 Located within the grounds are the graves of Kagekatsu’s wife, Princess Kiku (the daughter of Takeda Shingen) and Kagekatsu’s mother, Sentōin. 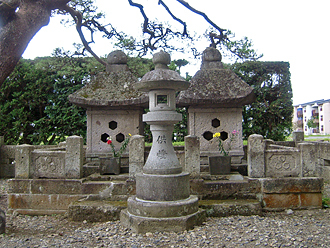 The grave of Uesugi Yōzan’s concubine as well as the wives and children of other feudal lords can also be found. 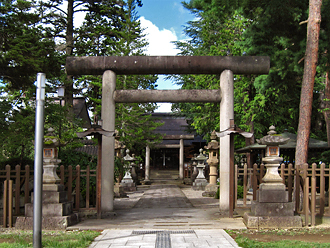 The grave of Naoe Kanetsugu and his wife are also located here. ※Entry into the temple is ceased in the winter season. Entry may also be restricted in the event of services and events. This temple was built by Kanetsugu Naoe, the senior retainer of the Yonezawa clan, in 1618. The garden is home to beautiful views from season to season, and it is said to be a reproduction of Tenryuji temple’s garden in Kyoto. A beautiful building built with Renaissance influence. Yonezawa Technical High School (now Yamagata University Engineering Department) was opening in October of the 43rd year of the Meiji Era (1910), the 7th Technical High School to be opened in the country and the first in the prefecture. 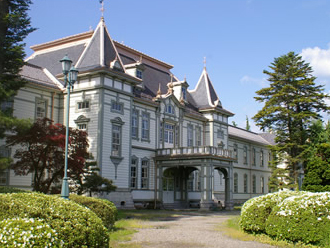 The main building was finished in July of the 43rd year of the Meiji Era (1910). Built in the style of a wooden Renaissance two-story building, there is, at both sides of the entrance, a mesmerizing tower-like intricately designed stairwell. The ceiling of the area around the stairs and conference room also has beautiful plaster decoration. 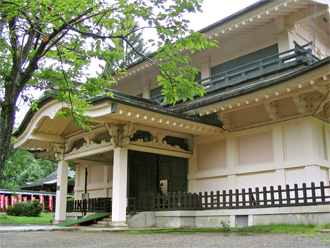 In the 46th Year of the Shōwa period (1973) the building was named an important cultural property of Japan. You can experience the true essence of traditional Sake-Brewing within Yonezawa in this museum. The warehouse’s vast grounds are home to a museum that displays the workings of a traditional sake brewery as well as tradtional sake brewing tools. With the aim of sharing the traditional art of sake brewing to the world – the museum was restored from and old sake distillery in 1984. Entering the museum you will be met with a traditional Japanese style wooden pillars spanning to the ceiling and metal pots used for brewing hanging from the walls. Discover the tradtional art of brewing Japanese Sake. There are also valuable articles of Uesugi Yōzan available for viewing in the ‘Uesugi Yōzan Display’ area. 31st of December, 1st of January. ※Numbers in brackets refer to groups booked for over 30 persons. In the Edo period, the Tokugawa Shogunate declared Christianity a crime and forbid it's practice. However, there were many secret Christians all over Japan who kept a strong faith in Christ but were ultimatley hunted down. In Yonezawa as well, 53 secret Christians including Uemon Amakasu, a member of the Yonezawa clan, were put to death in 1629. 300 years later in 1929, the execution ground was developed into a martyrdom site as with images of Christ, the Virgin Mary and the Baptist John being presented by Germany to honor the martyrs.. In 2008, Uemon Amakasu and other 51 people were beatified by the Vatican.